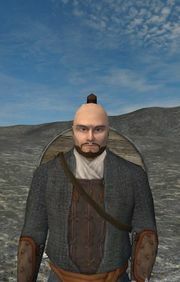 Dustum Khan is the brother of Sanjar Khan, the current leader of the Khergits. Khergit custom holds that a khan's lands are divided between his sons after his death. Dustum was away from the capital at the time of his father's death, but by the time he returned Sanjar had been declared the sole khan. This page was last edited on 1 July 2009, at 14:17.